I admit I’m a little disappointed that the days are getting noticeably shorter. I spend more time doing farm chores in the dark now, than in daylight. However, it’s all worth it once the classic aromas of fall begin to permeate every corner of the kitchen. The scent of pumpkin and spice has been filling the kitchen all week, but sadly, up until now, the end product wasn’t even remotely edible. This is because I was crafting multiple batches of Spiced Pumpkin soap in preparation for the upcoming holiday rush. However, the side effect of the soap-making is that I was left with an insatiable craving for something pumpkin! This Spiced Pumpkin soap contains real pumpkin, but you can’t eat soap! Fortunately, I had plenty of extra pumpkin puree on hand this afternoon so that I could finally squash (pardon the pun) my craving for the first loaves of my favorite Pecan Pumpkin Bread this season. For some of us, myself included, it’s almost impossible for there to be too many incarnations of pumpkin, or anything that contains roasted winter squash at this time of year. This is a classic quick bread, and is very easy to make, fills the house with the predictable aroma of cinnamon and spices, and begs to be consumed with a steaming mug of hot apple cider on a chilly autumn afternoon. Now that these loaves have finally emerged from the oven, I can finally, officially, declare that fall has arrived on the farm. This is, without doubt, is my favorite time of year! As I can’t share a slice with you, I’ll do the next best thing, and share the recipe instead. *Note: Because this recipe is oil-based (not butter or margarine) you can substitute unsweetened applesauce for the oil to decrease the amount of total fat in this recipe. This can be anything up to a 1:1 substitution without significantly affecting the quality of the bread. Lightly grease the bottom only of both loaf pans. In a large bowl sift the flour, baking soda, and baking powder together. Add the granulated sugar, salt, cinnamon, and nutmeg, and mix well to combine. In the medium bowl, combine the pumpkin puree, oil, water, and eggs, and blend well using a balloon whisk. Make a well the center of the flour mixture, and pour the pumpkin mixture into the center. Mix well with a spatula, and once combined, fold in the pecans. Pour the batter evenly between both loaf pans. 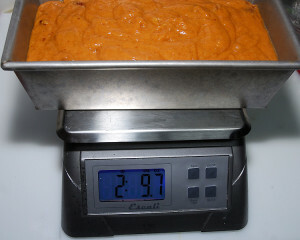 You can use a kitchen scale to weigh the pans and ensure the loaves are of equal size once baked. Level the top of mixture in the pans, and bake for 60-70 minutes, or until a toothpick inserted into the center comes out clean. Cool, in the pan, for 10 minutes, and then remove the loaves from the pans, and cool completely on a wire rack. No, really, resist the urge to slice until the loaves are completely cooled, so they slice cleanly. This bread is best enjoyed within 2-3 days of baking, and any leftovers can be stored in an airtight container at room temperature. Grab that steaming hot mug of apple cider, and enjoy! As this is a generous-sized recipe, you can share the extra loaf with a friend, or neighbor, or if you don’t want to share, just freeze the extra loaf for later. Enjoy! Yum! I wasn’t even hungry, but you’ve convinced me to grab a snack. Lately, I’m starting to think about making apple pie, too–my favorite fall dessert. Autumn isn’t my favorite season, but I’m appreciating it more as the years go by. That soap looks amazing too! Such an intricate pattern. Clare I love your soaps and hope to purchase some soon….and this recipe is perfect so I will be trying it soon…yummy! The pumpkin harvest has just begun in Maine and the first pumpkins are showing up in farmers’ markets and roadside stands. This bread looks like a great addition to my repertoire of pumpkin recipes. I love how easy this recipe is, Jean. It definitely helped to satisfy my craving, and really doesn’t take any time to make. Let me know if you try it! Pecans and pumpkin just go together well! This sounds delicious and smells from the kitchen do bring memories of Fall and cooler weather. Time to get the knitted blankets out and fill up the tea drawer. For years we’ve added a pecan-praline layer to the bottom of each pumpkin pie, thanks to a daughter-in-law’s tradition.